A popular health trend in recent years, coconut water is the clear liquid obtained by cutting a hole in the top of a young green coconuts. As coconut water has gained popularity, it is now widely available in grocery stores packaged in individual cartons. Free of fat and cholesterol, coconut water contains electrolytes, minerals like potassium and sodium that we lose when we sweat. Maintaining a balance of electrolytes is essential to staying hydrated. In addition, electrolytes affect your blood acidity and muscle action. Coconut water is particularly high in potassium. A typical packaged coconut water beverage has 644 milligrams of potassium. Potassium is in many foods, including fruits and vegetables. A banana or 1/2 cup of spinach, for example, have 420 milligrams of potassium. At around six months, a green coconut is filled with mostly coconut water. As the coconut matures, the coconut "meat" inside thickens and the clear fluid turns milky white as the fat content increases. By ten months, the outside of the coconut has turned brown and hard and the fluid inside is known as coconut milk. Coconut water is widely touted as a healthy way to replace fluid loss after exercise or diarrhea. In fact, coconut water is sometimes marketed as a sports hydration drink or hangover remedy. Additionally, some proponents claim that coconut water can help with health issues (such as constipation and high cholesterol) and promote weight loss. Is coconut water good for you? To date, few scientific studies have tested coconut water's health effects. However, there's some evidence that drinking it may offer certain benefits. Here's a look at several findings from the available research. Coconut water may not be better than water when it comes to rehydrating after a workout, according to a small study published in Journal of the International Society of Sports Nutrition in 2012. The study involved 12 men, each of whom walked or jogged for 60-minutes on a treadmill. After their exercise session, the participants had sipped bottled water, coconut water, coconut water from a concentrate, or an electrolyte sports drink. Three hours after completing the first treadmill session, their performance on a treadmill test was measured. After testing each participant on four separate days, researchers found that coconut water or the sports drink were not better than water at rehydrating or improving subsequent exercise performance. Another study, published in the International Journal of Sports Nutrition and Exercise Metabolism in 2017, found that coconut water was not better than water in hydrating or improving subsequent performance on a timed cycling test. Participants who drank coconut water reported more stomach bloating and upset than those who drank water or a sports drink. Consuming a large amount of potassium-rich coconut water in a short period of time may result in too much potassium in the body (a condition known as hyperkalemia). 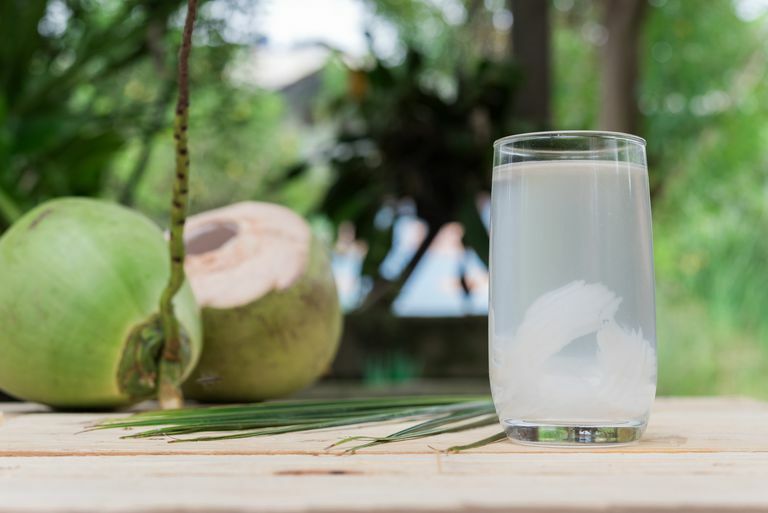 People with certain conditions (such as heart or kidney disease, diabetes, cystic fibrosis, or low blood pressure) and those at risk for an electrolyte imbalance have to be particularly cautious not to drink too much coconut water. Limit intake within two weeks of a scheduled surgery. Coconut water should not be used as an alternative to standard treatment for dehydration, especially due to diarrhea. People with severe dehydration should seek immediate medical help. Avoid coconut water if you have an allergy to coconuts. While coconut water from a fresh green coconut can be a refreshing beverage once in a while, there's currently no evidence that packaged coconut water drinks are better than water for rehydrating after light exercise. Kalman DS, Feldman S, Krieger DR, Bloomer RJ. Comparison of coconut water and a carbohydrate-electrolyte sport drink on measures of hydration and physical performance in exercise-trained men. J Int Soc Sports Nutr. 2012 Jan 18;9(1):1. National Institutes of Health. "Potassium in diet: MedlinePlus Medical Encyclopedia". October 2011. Peart DJ, Hensby A, Shaw MP. Coconut Water Does Not Improve Markers of Hydration During Sub-maximal Exercise and Performance in a Subsequent Time Trial Compared with Water Alone. Int J Sport Nutr Exerc Metab. 2017 Jun;27(3):279-284. Can Coconut Water Cure Your Hangover? Is It Better to Hydrate With Alkaline Water?